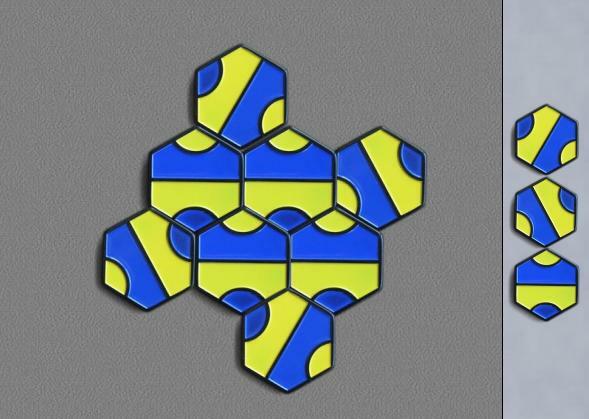 Palago is a tile patterning game developed by Cameron Browne. Palago uses a single hex tile which can tile a plane seamlessly. The object of the game is to form a closed shape in your color. The official rules are here, but briefly, you place two tiles each turn, the first anywhere adjacent to the existing pattern, the second adjacent to the first. Small "size 3" loops do not count. Robots: even the dumbot won't miss an easy win, but the experts claim smartbot and bestbot give a good game while they beat it. The back story: Palago is a complete "inside job". I had already worked with Cameron Browne on Truchet, and my good friends at Tantrix.com decided to manufacture and sell it, and supplied me with sample tiles. Even so, I was skeptical until I played it enough.